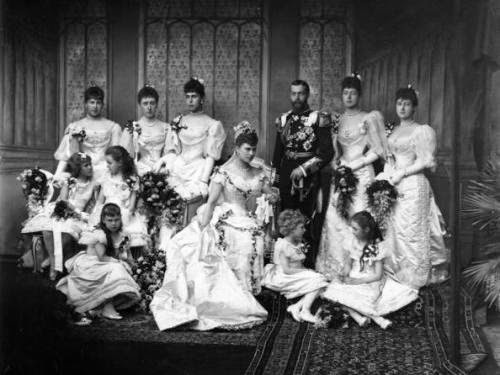 As Princess Mary of Teck walked down the aisle to her waiting groom, George, Duke of York, she must have thought about the tragedy that led her to this day, and this union. Mary, the daughter of the Duke of Teck and Princess Mary of Cambridge, a cousin of Queen Victoria, was originally engaged to George’s older brother, Albert Victor, known as Eddy, the Duke of Clarence and Avondale. Eddy was neither particularly attractive nor intelligent, and pretty much a stranger to Mary, but none of that mattered. 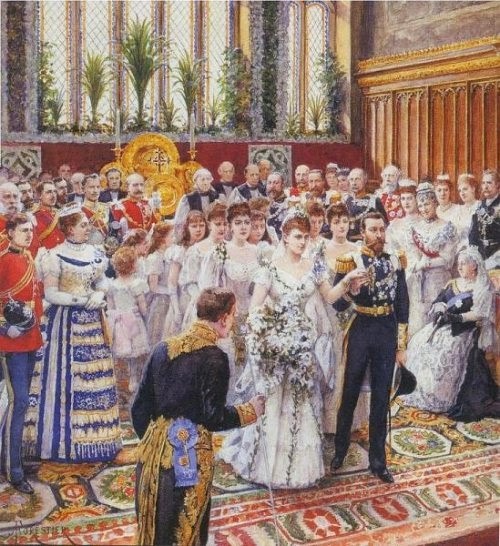 Queen Victoria, who was very fond of the English born and raised princess, thought the pair was well-matched and so, when Eddy proposed, in 1891, Mary said yes. But a few weeks later, tragedy struck. Eddy caught influenza, which developed into pneumonia. On 14 January 1892, he died at Sandringham House, Norfolk, less than a week after his 28th birthday. At his funeral, Mary laid her bridal bouquet of orange blossoms on Eddy’s coffin. Mary may have now slipped into oblivion if Queen Victoria hadn’t decided that she had what it takes to make a great Queen. So, she encouraged a match between Mary and Eddy’s younger brother and now second in line to the throne, George. The entire country expected George to propose to Mary too. But both Mary and George initially had lots of doubts about the suitability of this match. But, a year after Eddy’s death, George proposed and was accepted. Time would prove they had made the right choice. The couple quickly became very devoted to each other. The weather was hot and sunny, with only a slight refreshing breeze, on 6 July 1893, as the royal procession made its way in open carriages to the Chapel Royal at St. James’s Palace, London, among the cheers of the large crowd that had come to witness and celebrate the happy event. The bride looked stunning in a silver and white brocade gown, decorated with roses, shamrocks, and thistles and her mother’s lace veil. In her hands, she was holding a bouquet of white flowers. The ceremony was performed by the the Archbishop of Canterbury, Dr. Benson, with the assistant of the Bishop of London and the Bishop of Rochester. 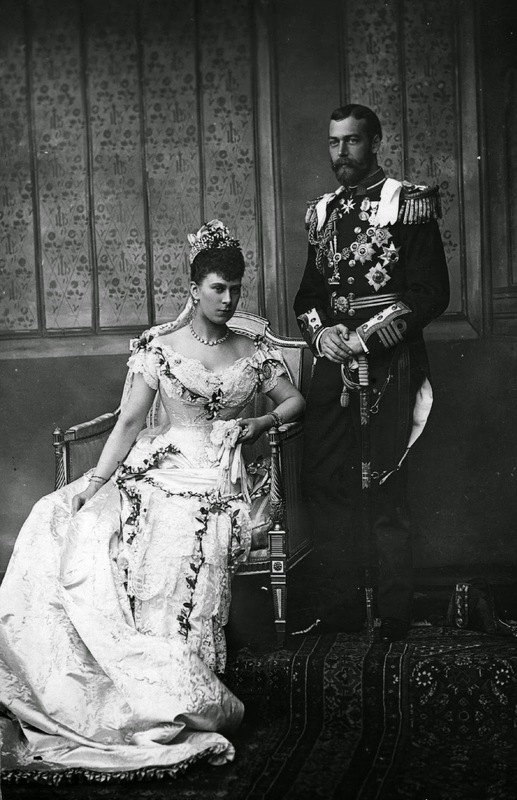 Among the guests were Alix of Hesse and the Tsarevitch Nicholas of Russia, which had recently got engaged. Afterwards, the royal party and their guests went to Buckingham Palace where a luncheon was served. The guests enjoyed a delicious meal, which ended with a very ambitious wedding cake. At 5pm, Mary, now wearing a dress of white Irish poplin, and George left the party for their honeymoon. They would spend it at York Cottage, on the grounds of the Sandringham Estate.